Jigglypuff requested that I backup my claim that the writing in Overwatch is bad. He’s right about archetypes as a concept. Committing to a baseline that’s familiar to the audience is a tried-and-true method that every writer uses, and when establishing brand new fictional worlds without pre-existing lore (such as Overwatch) they’re the best way to give the players something to initially latch onto. If they can understand part of the world intrinsically, it’ll make it easier for them to accept the rest of the world. But the other upside to standard archetypes is that they free the writer from worrying too much about the overall story, and can instead focus on the language and the details to really hammer home their unique visions of the characters. And that is where Overwatch fails, because the writers remain very shallow in their use of in-game dialogue to establish character. Good writing accomplishes multiple things with every line. Whether it serves to reveal gameplay information to the player, affirm the speaker’s personality, build the world, or drop clues/foreshadowing, it needs a reason to exist other than for the sake of just filling silence. These lines just don’t do that much, other than barely reinforcing the character’s personality to an extremely shallow degree. 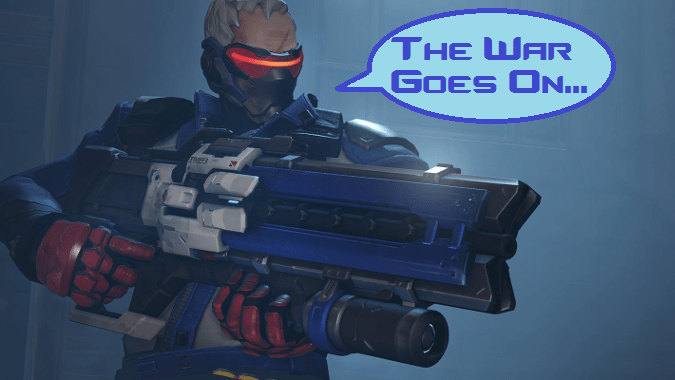 Reinstadt’s reference to Hasselhoff as classical music is the best thing in those five lines because it highlights Overwatch’s time period in a humorous way. I particularly dislike Zenyatta’s due to being pseudo-philosophical and logically flawed, a frustrating copout that too many writers use when writing zen-like monk characters. So many of the lines are just predictable. They’re the first thing that pops into one’s head when shown an image of the character, and go no further to add value to the character saying it. These lines work in three different ways: they highlight Nick’s abrasive and mistrusting personality, they reinforce how dire the survivor’s situation is, and they demonstrate that the survivors have no choice but to attempt the death run across a zombie-infected bridge to safety. Coach also gets a chance to put Nick in his place, after an entire game of Nick constantly challenging his attempts to serve as the moral backbone to the team. I learned more about Nick and Coach’s relationship in that once exchange than any of the Overwatch ones quoted above. But the absence of references to the expanded canon are almost certainly intentional. Much like Team Fortress 2, Blizzard seems to be trying to prevent continuity lockout by quarantining the world-building to the supplemental materials, which is a good choice. But again, that means that the in-game writing should work twice as hard to stand on its own merit, which it does not. 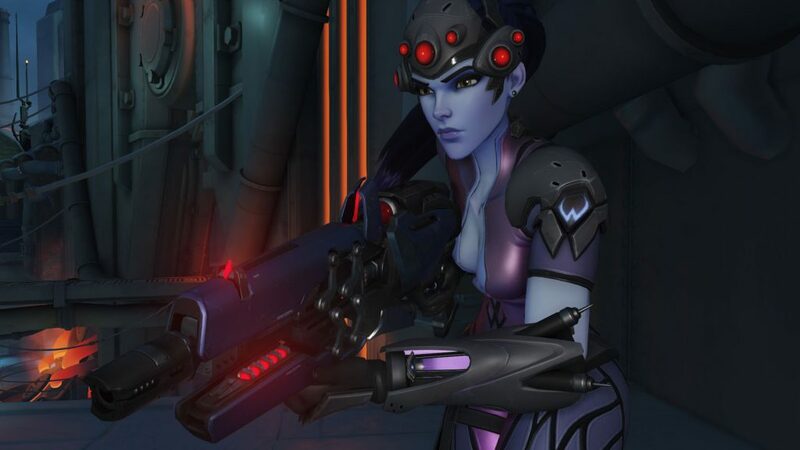 Many characters use lines that graduate from “archetypical” to “lazy.” My perpetual example I repeatedly use is Widowmaker’s spawn line “One shot, one kill…” which has got to be one of the most over-used lines for a sniper character in video game history. McCree’s ultimate, which results in him quickly gunning down every visible enemy with his six-shooter, leads with him growling, “it’s high noon…” This is a reference to the 1952 film, which confuses me because that film was famous for its very un-Western hero; Gary Cooper’s sheriff was not a fast-talking grizzled lawman who gunned down people with aplomb, and in fact High Noon was one of the least action-packed westerns of its time, and McCree’s line seems to fundamentally misunderstand its source. Reaper is just a treasure trove of bad writing, from “T͢͞i̢͢͡ḿ̧e͘͝͡ ̛͟t̷̷̕ǫ ̨r̷̡͞e͢a̡͏p̧̛͠.̀͜͝.̡.̨͟” to “D͢ȩ̀a͢҉t̨҉h͡ ̸̀͟w̕͟a̛͘l͏͡k͜s̷ ̸à̴m̛ó̶̕ǹ͟g ̡͢ỳ̷͠oú̶͠,̷͟͢” and especially his ultimate attack, a flurry of bullets to the sound of “D̢I̡Ȩ̴̕ ̶̷D̵͠͡Į͘E̕͠ ̴̕D̵̶̡IĘ̷͘! !̸͡!̷̢̕” Many of the lines feel like the very first thing that popped into the writer’s head that matched the character archetype, which is frankly under-using the nuanced backstories and excellent character designs the writers were given to work with. Mercy is the character I can speak most about, since I played her for most of my time in the beta. Almost everything she said during the match was variants of “I’ll heal you,” “I’m watching over you,” and “I am a doctor.” I came away from playing her having learned almost nothing more about her character. Her backstory states that she’s a world-renown nano-surgeon who broke off from Overwatch due to her concerns with their overly-militaristic methods, and was often at odds with her superiors. Her in-game personality does absolutely nothing to demonstrate this. In contrast, the TF2 medic cheerfully establishes himself as a deranged psychopath who relishes in the more violent aspects of his mercenary work, with lines such as “The healing is not as rewarding as the hurting!” “That was doctor-assisted homicide!” and an excited “One, two, three…I do not think we brought enough bodybags!” I completely understand why the TF2 Medic is bonesawing people on a battlefield instead of working in a hospital, but Mercy’s dialogue makes me wonder why she’s not in some third-world country saving people from epidemics. Hanzo’s writing has a similar problem with lacking substance. Now, to be fair, I don’t have as much experience with the character as I do with Mercy, but it seems all I ever heard him talk about on the battlefield is his Dragon. “Let the dragon consume you!” “Peer through the eyes of the dragon!” “Marked by the dragon!” These lines get repetitive fast, as will often happen when a certain word is used over and over. Take a similar character from another game: the Fisherman is a playable character from Bioshock 2 Multiplayer, and he is obsessed with the sea. His abuse of Adam has led him to believe that he is the physical embodiment of the ocean, and his lines reflect this while steadfastly avoiding overuse of any given word. “The sea demands your sacrifice!” “These hands have slaughtered whales!” “Batten down the hatches, men!” By referencing multiple aspects of the ocean and peppering nautical terminology throughout, the dialogue hammers home just how much this character cares about the sea. If Hanzo had more references to expanded terminology and related sayings, instead of just dragging on about the dragon, his commitment to his philosophy would be more show and less tell. This is a more interesting and multi-faceted take on the character. He showcases his practicality, amenable personality, and demonstrates a financial motivation for his work. As the short goes on, there’s even a side plot showing phone calls with his disapproving parents, revealing an element to his backstory we didn’t know before watching the movie. Widowmaker’s video is missing this. Sniper’s line “Boom, Headshot” is a reference to Team Fortress Quake, the game that introduced headshots to the FPS genre. 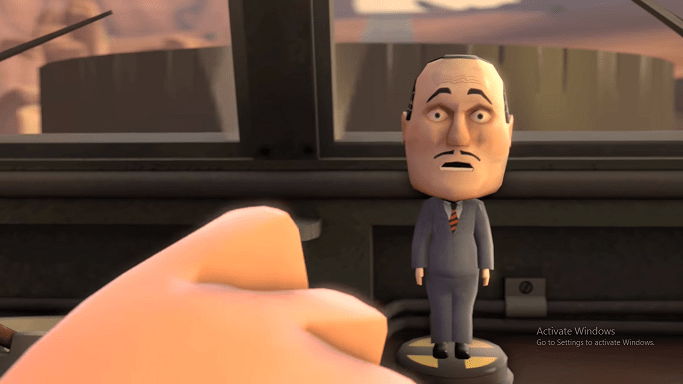 The Civilian bobblehead is there to reinforce this. Luckily, videos starring Winston are far better, probably because he’s less cliche than Widowmaker is. They also veer away from the TF2-style “Meet a teammate” premise and primarily serve to build lore, and I hope Blizzard sticks with that because they do it far better. But this article is mainly focused on in-game dialogue, and in that department I still find the game sorely lacking. The writers need to think more deeply about the characters and not resort to easy lines of filler. They need to worry a bit more about surprising the listener and taking characters in a direction that’s unexpected or unique. It’s okay to have characters who are archetypes, but the characters need to springboard off of their origins to become more distinct from all the other examples in fiction who use the same archetype. The art style does an amazing job on that front, the concept and design team did an amazing job on that front, and the gameplay and playstyles do an amazing job on that front. But the writing is not holding its end up.